Kathmandu may be most visitors’ entry point to the wonders of Nepal, but it is cussedly difficult to love. 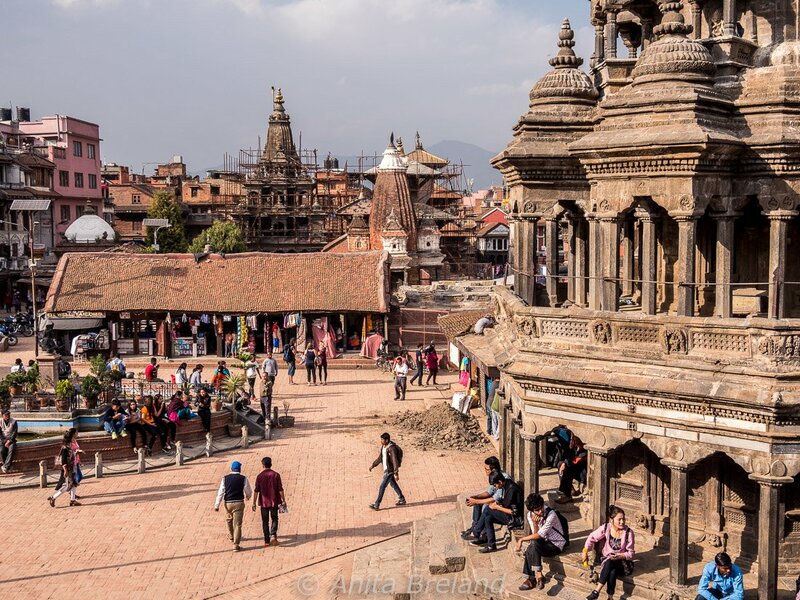 Many of its ancient structures were lost to the 2015 earthquake and reconstruction and rebuilding continues everywhere. Efforts to make badly needed, welcomed improvements to the city’s crumbling infrastructure have further ratcheted up the chaos quotient of the city. When Tom and I had an opportunity for a glimpse of the indigenous Newari culture in the outlying towns of Kirtipur and Patan, we were happy to take a day—and our face masks—off, for a “Newari break” from Kathmandu’s craziness. Rakesh Shahi, founder of Mystik Mountains Adventure & Holidays, was our guide, introducing us to Newari foods over the course of our day together. We had lunch at a traditional restaurant in Kirtipur, a center of Newari culture and architecture in centuries past. 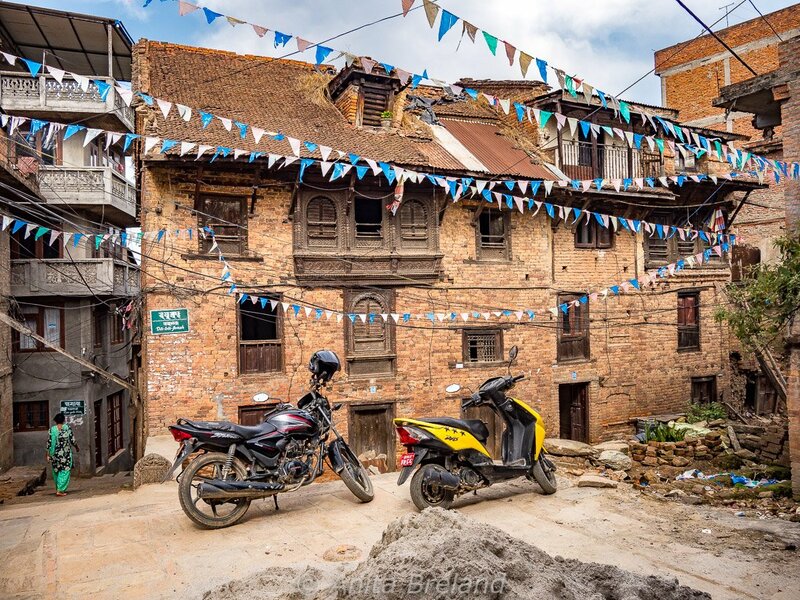 We visited at a mainstream Newari restaurant in Patan, where we enjoyed a break for lassi under an ancient, low-slung roof and at a table with a view of Patan’s Durbar Square. Finally, we stopped for sweets at a tiny Newari restaurant just a few blocks behind Durbar Square. We had a great time, and learned quite a bit of history too! The Newars, one of Nepal’s 100 or so ethnic groups, are party people, seriously! 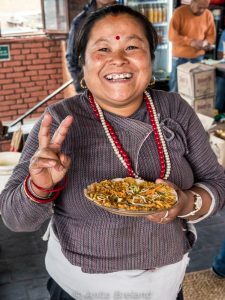 Their love of food and drink is legendary among Nepalis and food from Newari kitchens has made its way from festivals in the Kathmandu Valley onto restaurant menus in the city and beyond. In Kirtipur, our destination was Newa Civilization, a traditional restaurant on a hill, with a view toward Kathmandu in the distance. There we shared a Newari “meal set”, called Samay Baji, along with several other foods from the Newari kitchen. We took our seats on rush floor mats and Rakesh placed our order. 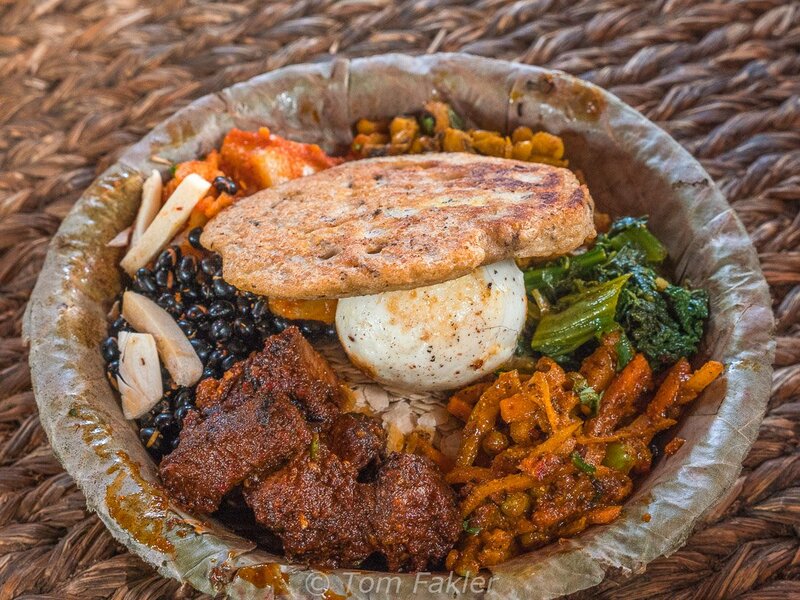 Samay Baji is a Nepali thali platter/bowl, but with a focus on the snack-like dishes that Newari folks love. Our meal set featured sub-dishes of varying spice levels and textures: legumes toasted and boiled, flavor hits from fried garlic, raw ginger and stewed tomatoes and onions. Flattened rice as a base provided crunch, as did the toasted soybeans. A boiled egg, dried sardines dusted with cumin, and marinated, grilled buffalo meat added to the protein quotient. 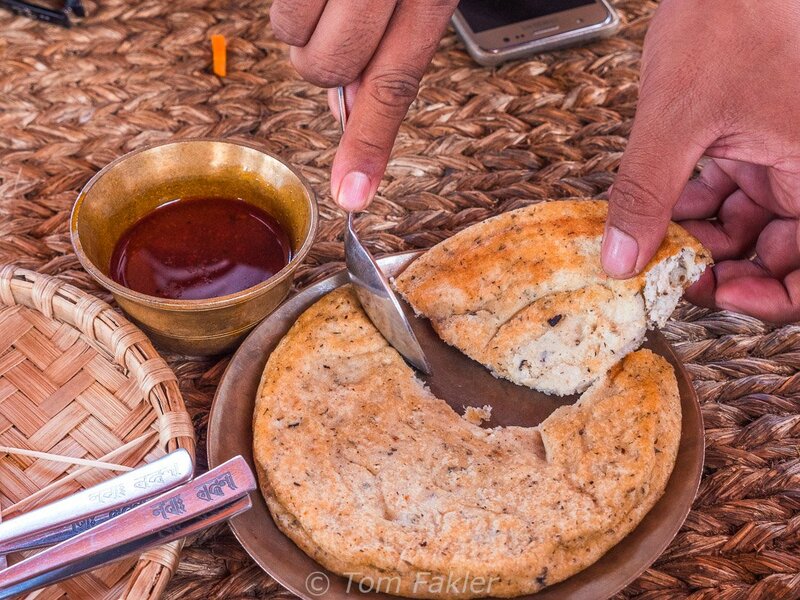 The dish’s topper, a lentil pancake called woh offered a gentle finish to the meal set. 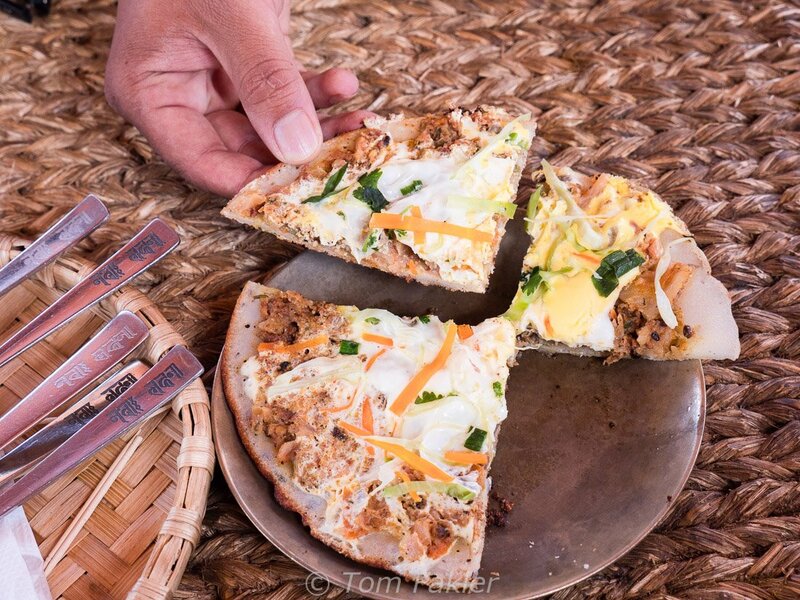 In addition to Samay Baji, we had Chatamari, sometimes called “Nepali pizza”. The Nepali beverage of choice for this meal is barley beer or a tumbler of firewater called “special wine”, served in levels of potency from First Water to Fifth Water (ours was somewhere in the middle range). Special wine is worth ordering, just to watch the server’s pouring technique! A rustic version of Samay baji, served in a disposable bowl made of banana leaves. Chatamari, a crisped rice pancake topped with any of a variety of spiced mixtures and an egg. We had an extra helping of Woh, along with a shot of Newa Lahana Special Wine. Local families enjoy time together at Newa Civilization. Behind them, brass jugs for dispensing Special Wine. 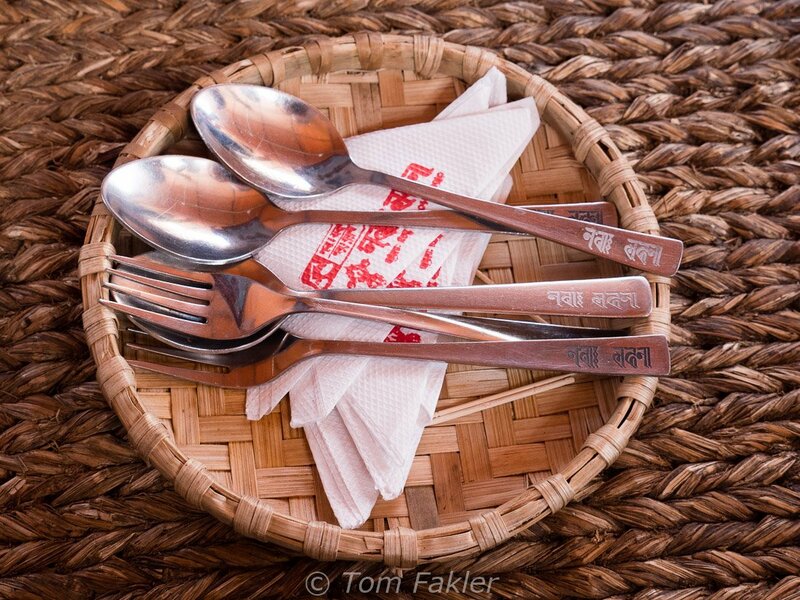 A lovely restaurant occupies a prime location in a historic building on Patan’s Durbar Square. The setting for Yala Layaku Kitchen is magnificent and atmospheric: fancy carving around doors and windows, low-slung ceiling and steep, steep stairs to the dining rooms overlooking the square. 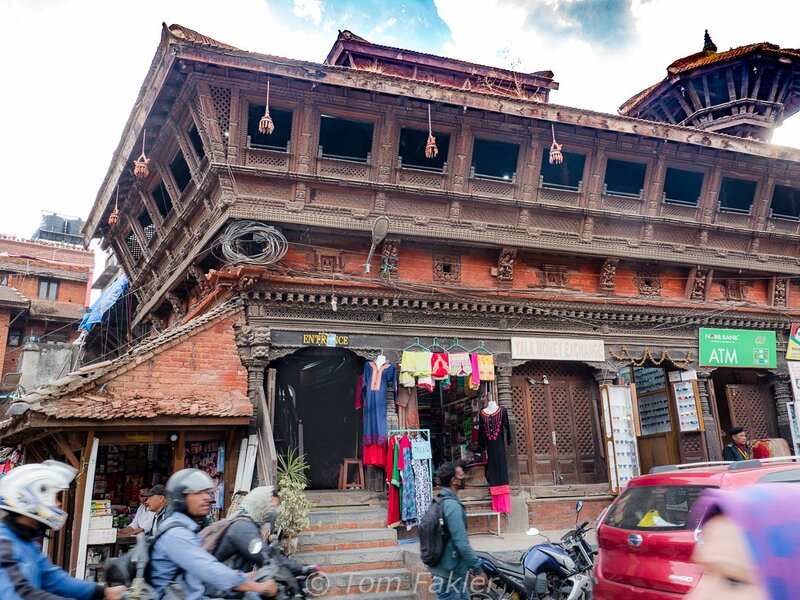 Yala Layaku Kitchen in Patan serves a full range of Newari specialties (and has table seating), but is worth visiting for the architecture and the view. Patan’s Durbar Square, from our perch at Yala Layaku Kitchen. 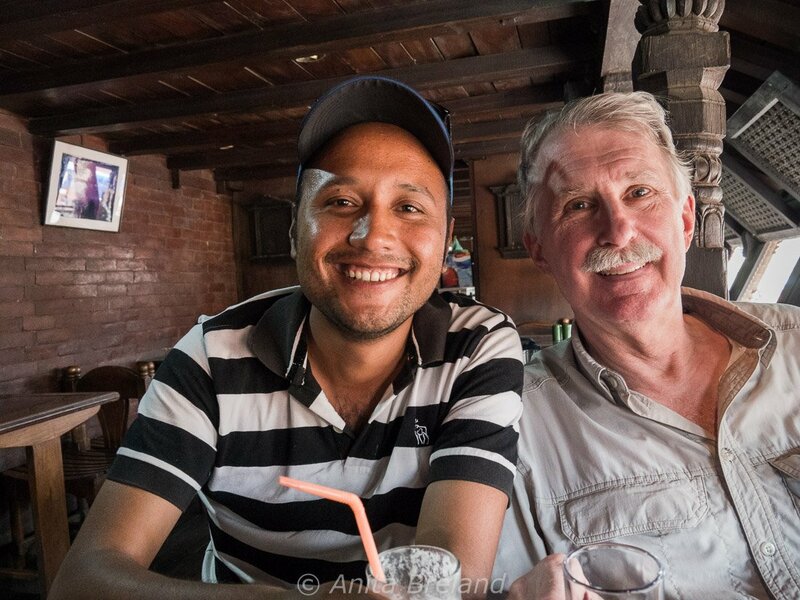 Tom and Rakesh enjoy a lassi break in Patan. 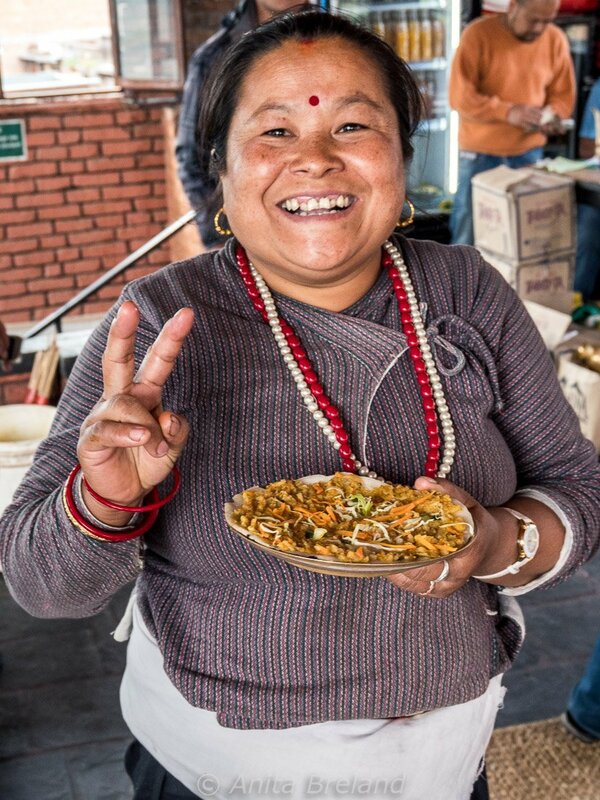 Nandini Food Court is locally famous for its Newari kitchen, operating street-side in Patan. 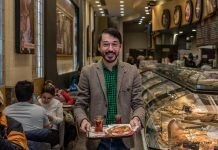 There is no view from the restaurant, just the marvel of a one-woman show as the proprietor-cook fills orders for Samay baji while managing simultaneous conversations with customers and making change. Seating is available near the front entrance and in a couple of rooms upstairs. We had already had our Samay baji fix in Kirtipur, so Nandini made two kinds of sweet yomari dumplings for us: one filled with a mixture of molasses and sesame seeds, and the other with molasses and coconut. 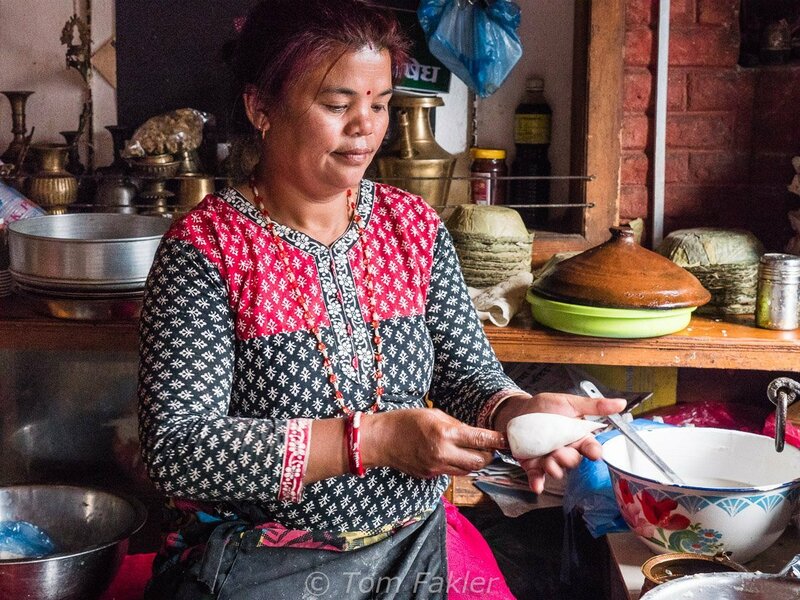 The prized rice dumplings are Newari specialties, enjoyed at festivals and for holiday meals. Watch her shape the dumplings into fig-shaped pockets filled with coconut. Thank you, Rakesh for our day together, and for giving us a glimpse into a fascinating aspect of Nepali culture! And thank you Elena Paschinger for introducing us to Rakesh!